It was a perfect time for a bike ride. The early evening air wasn’t too hot and the sky was still a bright blue. I took two of my children on the ride and slowly we made our way up and down our rolling Pennsylvania hills. She hadn’t been feeling very well on the ride, and we’re not sure if she fainted on her way down or simply lost control of her bike. Either way, because I was bringing up the rear, I had full view of the worst fall I’ve witnessed in all my 20 years of mothering. As we waited for the ambulance to respond to our 911 call, I tended to my poor, broken little girl the best I knew how. I kept her awake by helping her remember the events of the day. I answered her questions the best I could about the extent of her injuries and why she was lying in the road. Mixed into that traumatic experience of shock and horror, something welled up within me that obviously needed to come out. It was an overwhelming, almost tangible love for my daughter. Everything, all the stuff and worries of life disappeared out there into the country air and endless acres of land. And I was struck with the incredible value of relationship. We get caught up with the cares of this world don’t we? Where’s the money coming from for that bill? Did I make a good impression on my boss or client? Am I getting too fat? It’s all in our face, sometimes pulling us down and making us forget what’s most important. What really matters – who really matters. A few years ago, I watched the movie “Courageous” with my family. It was a wonderful Christian movie about some dads who, through a series of events, decide to make a covenant to take their fathering responsibilities seriously. In one scene, a dad’s daughter asked him to dance with her. I remember that they were on a curb next to a road. And the dad was embarrassed to dance with his daughter in public. It’s not that the man didn’t love his daughter, you know that, it was just, well, the stuff of life had his focus. Not dancing with his daughter that day, however, becomes a huge regret for this father because soon after that she is tragically killed in a car accident. Tragedies are painful and difficult, but if we let them, they sometimes can wake us up to what’s really important in life. In a tearful scene at the end of the movie, the dad returns to that curb alone. He takes himself out of his vehicle, goes to a grassy spot and slowly … he dances. Oh, I know that as responsible adults we need to bring in money and put food on the table. But now, more than ever, I’m going to try to embrace the preciousness of each relationship God has placed in my life. 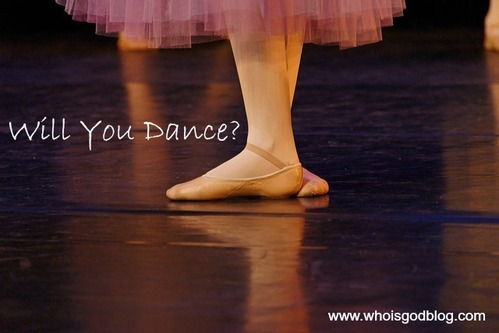 How about you - will you dance? are like arrows in a warrior’s hand. 14 When Jesus saw what was happening, he was angry with his disciples. He said to them, “Let the children come to me. Don’t stop them! For the Kingdom of God belongs to those who are like these children.